I know the title “I promise you one of the most meaningful days of your life” sounds grandiose but I mean it and I hope you’ll read through to the end and choose to take one small, totally free action, that will change your life and likely those of others. 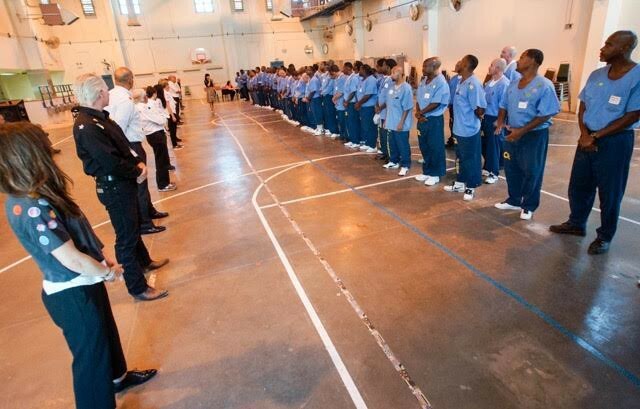 On September 10th of this year I spent an entire day in California State Prison with people who had committed felonies and worked with them on business plans to help them create legal enterprise upon their release as part of Defy Ventures 6-month training program. I hadn’t cried this much maybe since childhood. Not cries out of pity but out of joy, pride and sadness at the lost lives, broken families and a broken system but also at the hope, ambition and remorse that I witnessed. I wasn’t verklempt — I wept. I hadn’t felt this human since the day my two sons were born. I felt a deeper connection with human beings than I have felt in many years. I gave myself to help others but it was clear that the prisoners gave me as much as I offered. They showed vulnerability and a genuine interest in learning. I sat standing 1 foot away from somebody who’s been in prison for 15 years of his life and I had 60 seconds to open up to him about something that causes me pain in my life while he stairs into my eyes I found myself going deeper than I would with even friends or family. How could I not? Similar men had just gotten done telling me about their own childhoods. They told me of losing fathers at 3, of moms on drugs, of uncles that asked them to hold guns to cover them at 8. Grown men, prisoners, with huge muscles and tattoos everywhere cried and told me stories. And they didn’t want pity. They wanted opportunity. They wanted to learn. 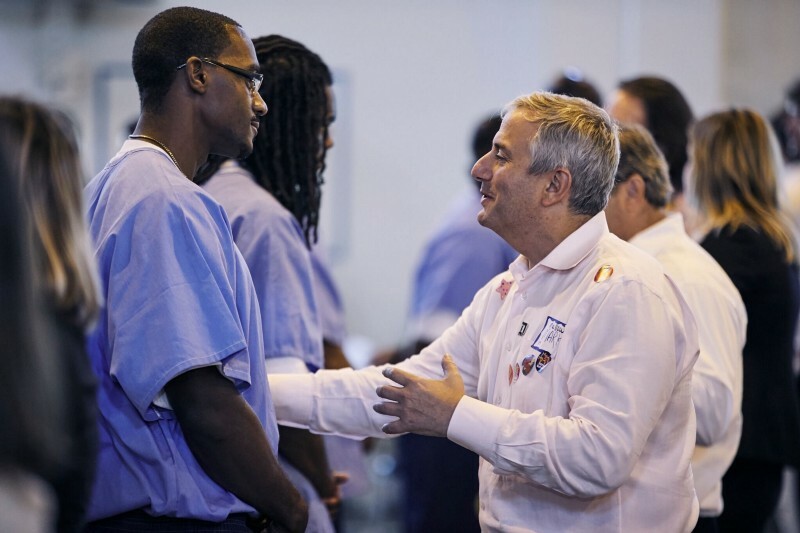 Defy Ventures is a program that aims to educate people in prison to become better humans upon graduation. They offer classes in personal responsibility and accountability, they teach men to forgive themselves and to forgive the people who perpetrated them as children because they all grew up surrounded by bad influences. Defy teaches them to love themselves and their fellow man but also to love and respect their families. Defy teaches them personal finance like how to keep a checking account, the difference between debt and equity, what cashflow is and so forth. And then Defy encourages every member to create a business plan for a business that they can launch upon release with an emphasis on tangible businesses that can be cashflow positive in just 3 months. Defy Ventures runs business plan competitions and has people like us who attend and give business advice and feedback. You can go. You SHOULD go. Here is how. You can make excuses — many do. But if you commit one simple day of your life I literally promise you that you will email or Tweet me a “thank you” and tell me you’ve been moved. I know because I went back a second time with 75 or so tech executives and VCs and my inbox is flooded this morning. She works as hard and is as committed as any of you founders or VCs out there and she’s absolutely crushing it on impact and results and the better she does — there is no upside for her. She runs a 501c3 (non profit). When she talks in prison she commands the respect of every person in the room — and you’re obviously talking about some pretty hard individuals. When she stands in front of executives she doesn’t cater to us. I’m sure she appreciates us but she’s not there to kowtow. We are on a level playing field with the EITs. And I watched her get up in the grills of people who are convicted of serious crimes and get them to confront their anger, frustrations and fears. 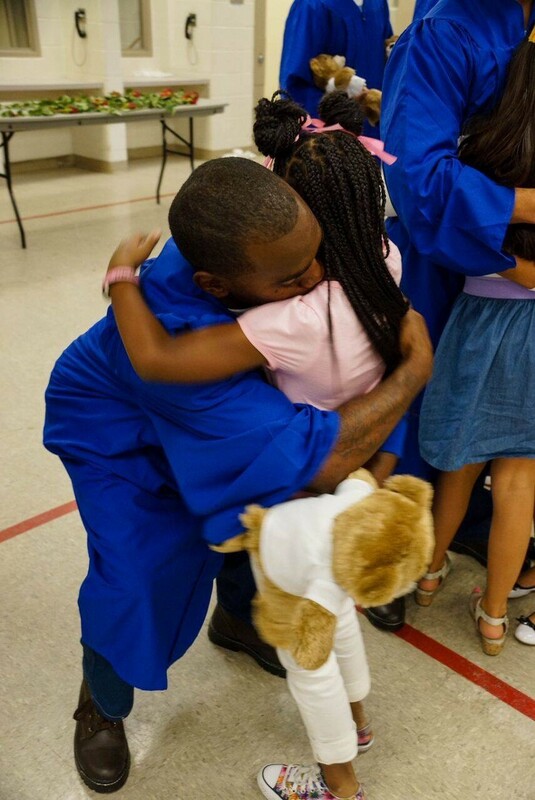 I watched her when the graduates met their family members and you can see that the “everything” to her is the bond between incarcerated men and their children and wives. As Cat says, “the best way to keep these men from coming back to prison is to find a way for them to earn legal dollars.” And as I’m sure you know the system isn’t exactly hospitable to employing ex-felons so the best way to sustain them is to find self employment and for them to hire each other. And the results? 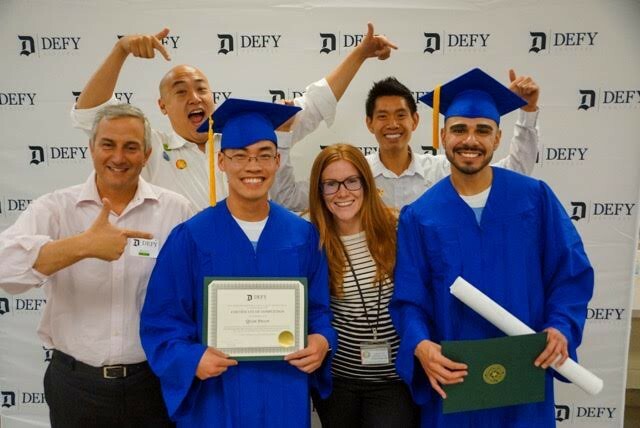 Defy Ventures graduates have a 3.2% recidivism rate (the rate at which they are re-incarcerated) against a national 5-year average of more than 75%. The 3-year recidivism rate in California for comparison is more than 50%. And of course Defy has a post-release program to help with reentry into a society not geared towards helping with recovery. They charge alumni $100 / month to stay in the program to make sure they have real skin in the game. 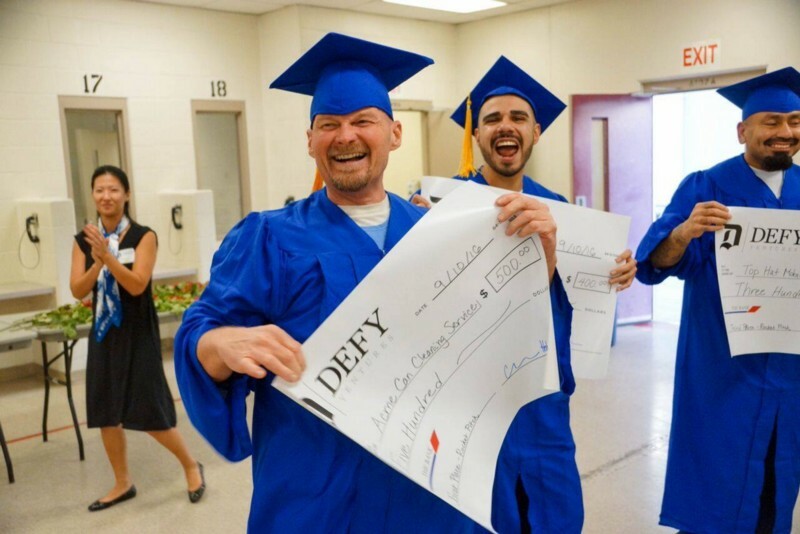 I this all sounds like psycho-babble but I promise you that if you’ll commit just one day of your life to go to prison with the team at Defy Ventures you will feel profoundly moved, you will feel deeply human and you will feel the calling to do more. It will shred every perception you have about convicted felons and the penal system in the US. 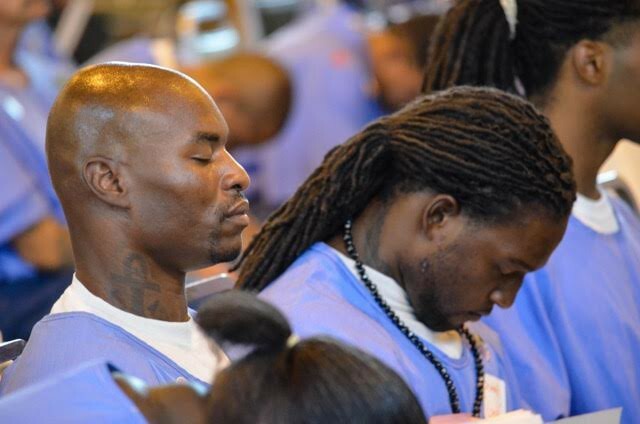 It’s not that these men aren’t guilty — they are — but that the system is biased towards over-incarceration and sentencing to people of color and has a byzantine set of rules that often elongate the sentencing of those who don’t have resources to fight them. And leaving aside the penal system you probably have pre-conceived ideas of what it would be like to sit and talk with somebody who has committed armed robbery, been in a gang or even committed a violent crime. I went in feeling intimidated to be in a room with these men. By the end of the day I was eating pizza at the same table as them asking them questions about their lives and they of mine. There is literally no way for me to describe this — you just have to experience it. You forget they are prisoners and realize they are men who have done bad things and made mistakes — many of them as teens. You forget you’re in a maximum security prison. You lose all fear and inhibition and even find yourself pushing yourself to be more open. I know this will happen because I’ve now watched it on two occasions with more than 100 tech executives. I watched tough men melt as they made commitments to their children and wives upon their graduation ceremony. 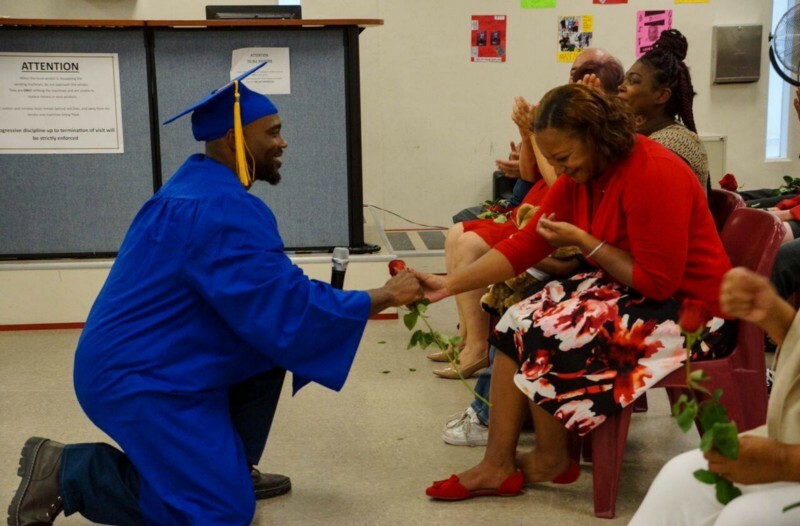 I watched this man who has been incarcerated for 20-or-so years get down on his knees and re-propose to his wife and promised her to be a better man and stay true to the Defy mission upon graduation. No: There was not a try eye in the room — inmate, business executive or family member. I watched a man who had a 9-year old struggle to tell her that he loved her and that she was smart to her face. He kept telling the audience but struggled to tell her directly. Cat was having none of it. She went to him, asked him to look in her eyes and tell her directly and he did. But nobody ever told him to his eyes that he was good or loved and so it literally wasn’t an experience he knew how to deal with. Anybody who has been on a Defy trip know the drill. You get in a line with executives on one side and EITs (entrepreneurs in training) on the other. Cat hates calling them “inmates” or “prisoners” or “convicts” or any other label that emphasizes the worst things they’ve done in their lives and wants them to see possibility in their futures. She asks you to “step to the line” when a statement made about you is true or back from the line when it’s not. How many of you were raised with 2 parents? How many of you had violence in the home? How many of you lost an immediate family member before the age of 18? How many of you finished high school? Of course the contrasts are stark and the questions get more personal and much harder to hide from the privilege our side of the so obviously enjoys. How many of you were suspended from school ever? How many of you committed an act for which you could have been arrested — whether you actually were or not? On that question nearly every person is at the line. The difference? On our side if you were truly busted for a “stupid childhood indiscretion” you simply hire lawyers to get out of situation with a hand-slap unless it was truly a heinous act. Oh, wait. Even those have a price in our society … Brock Turner raped an unconscious woman and was released in 3 months. Can you really say we wouldn’t have thrown away the key on a poor African American or Latino who wasn’t a white, Stanford swimmer? What Tangible Thing Can YOU Do? Go to prison with Defy Ventures. The rest will just happen. And you will never see our society in the same light. I met Catherine several years ago at the request of my good friend and colleague Mike Su. He kept telling me how profound this prison program was and would I meet Cat. Yeah, yeah, whatever Mike. Sure, I’ll meet her. Mike didn’t let up. He asked and asked and asked until I ran out of excuses and I met Cat again and agree to come. Honestly, Mike is a mensch and never gave me a hard time and also never gave up on me. And I will never be the same. It’s that simple. I got as much as a gave. And I’m a huge believer that “a few people can make a really big difference” and start a snowball effect. So I committed to going back again and partnered with Brad Feld to bring a team of 75 entrepreneurs and VCs to do it with us. And my hope that as Mike brought me and I brought others that we can now create a snowball effect where every person in our industry makes a trip to prison. If we can experience the system we can begin to fix the system. Until then it’s theoretical. Brad and I had such a positive experience that we’ve committed to now leading a delegation of VC and tech executives in the Bay Area as soon as we can coordinate it. I’ve given my time and my money but I know I can do more. “They gave me every opportunity to succeed. I wasn’t raised badly — I was well educated. I made a mistake when I was 19. I was with the wrong crowd. And I’ve paid dearly with the last 13 years of my life. I will never be back here again and Defy gave me the confidence to believe in myself. You know what else he said? In front of the entire crowd? And then he paused and his voice quavered. It was the first time in 13 years that anybody other than my family had actually spent 30 minutes thinking about my well being. It was the first time in 13 years that I truly felt human. Defy Ventures has given me my humanity back. And it will do the same for you. Please take that small action. Attend. It’s free. Don’t worry whether you’re “qualified enough” — most of the ideas are about building businesses in landscaping, car detailing or graphics design — all businesses designed to cashflow. And I promise you that you’re qualified to have an opinion on these things. And by the way — you’ll also become kindred spirits with the execs who go on your trip so there’s that benefit, too. The winner of my first visit? 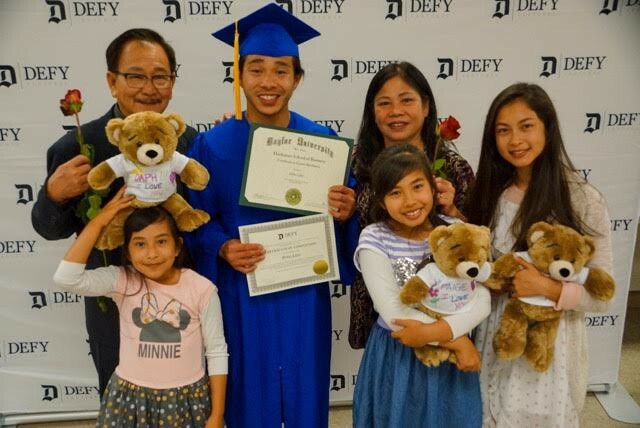 To be the most successful Defy Ventures graduate in the history of the program so I can employ the most number of Defy graduates and give back to this community that has literally changed my life. On our most recent tour Caroline Fairchild from LinkedIn attended. I promised her I would write about this experience for the LinkedIn platform so I didn’t write about yesterday’s trip here. I will write about that as soon as Caroline is ready.